LET’S EAT! (開飯啦!) 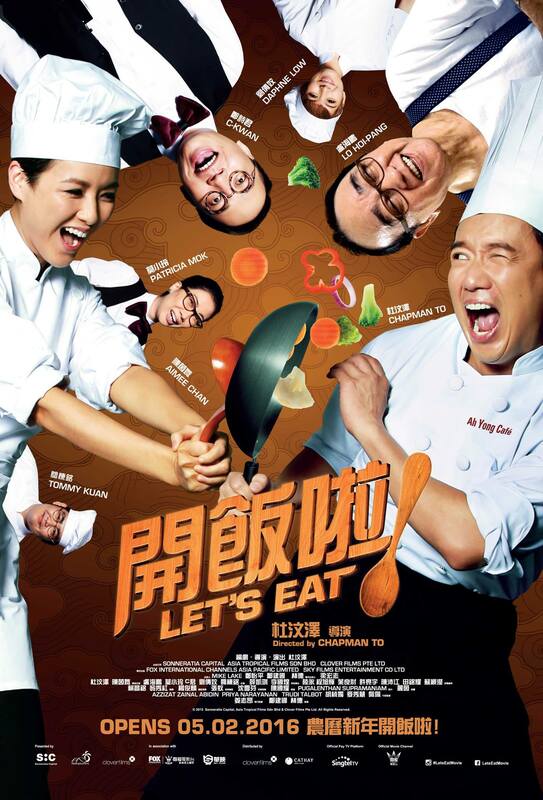 depicts how the head chef Dai Hung (Chapman To) and owner’s daughter Rosemary (Aimee Chan) of AH YONG CAFÉ set aside their differences and embark on a quest to save the once reputable restaurant. The movie will showcase the many tantalizing aspects of Southeast Asian cuisines, do expect plenty of banter and sparks between the movie characters! Chinese New Year usually means a series of lighthearted comedies in the cinema for all movie-goers to watch. Chapman To is back again, collaborating with Singapore and Malaysia comedians, this time about the local delicacy (Hainanese Chicken Rice) instead of Mahjong. It was a fun experience to watch the love-hate relationship between Dai Hung (Chapman To) and Rosemary (Aimee Chan) develop. The dramatic slow-motion trying to bring out the suave-ness of the characters made it hilarious. What’s more, Chapman and Aimee made an interesting contrast where traditional meets modernized, uneducated meets masters degree, old meets young and experienced meet newbie. I like how the director brought out the several notable socializing trends thanks to digital media. Making fun of behaviour such as taking selfies with other people and posting them on social media to make someone else jealous, stalking people on social media and second-guessing what they think, taking photos until the food turn cold, these are habits which I am guilty of sometimes. Also, the film brought out the point about the Korean wave where anything related to Korean seems to sell well and no one really care about the quality of food anymore. While I like the idea of focusing on the quality of food, there was a scene where the chef Dai Hung cooked a spread of Chinese delicacies – black pepper crab, fried prawns etc while reflecting on the incident that happened in the day seem a little redundant. Perhaps there might be scenes being taken off, but having no follow-up scenes of what happened to the food was indeed a pity (for the audience). We want to see the table-full of delicious food appreciated and not gone to waste! Acting wise, the film was so heavily reliant on the two main actors Chapman To and Aimee Chan (thank god for their great acting!) that the supporting roles were forgettable. It was a waste to watch the characters spend most of their time either snacking and nodding her head (Daphne Low) or acting useless and parroting the boss (Sze-kwan Cheng, C-Kwan). A fan of Hong Kong comedies, I was anticipating this film. I couldn’t help but be disappointed by the bad Chinese dubbing. The mandarin were not in sync with the characters’ lips and the tone did not match the actors’ expression. It spoilt the whole experience and I will recommend everyone to watch the film in Malaysia where there is the Cantonese version instead. This film was written, directed by Chapman To. He is also the lead actor of the film. The original theme song 《幸福的美味》is sang by Singapore singer-songwriter Chriz Tong 湯薇恩. Mark Lee cameoed in this movie while starring in Jack Neo’s Long Long Time Ago movie out on the same day. After working with Chapman To in King of Mahjong (麻雀王) last year, he was more than happy to help out in this movie. However, as it clashes with Jack Neo’s film, Mark Lee alerted Jack Neo and was surprised when he gave the green light. Majority of the filming took place in Kuala Lumpur, Malaysia. For the film, Chapman To and Aimee Chan went to learn how to cook Hainanese Chicken rice in June. Chapman even make use of the filming set kitchen to make chicken soup for everyone. Filming for “Let’s Eat” was Aimee’s first time leaving his son for so long. It was only 6 months after the childbirth when she had to leave him. It was a dilemma for her to leave the son. However as the shoot was very fun and took only about 12 hours a day. she managed to have plenty of rest and the filming felt more like a holiday as compared to the 4 hour sleep she had back at home when taking care of her son. Check out Let’s Eat! (开饭啦!) Facebook Page! Let’s Eat! (开饭啦!) is out in cinemas on 5 February 2016. I’ve been into films that kind of revolves around food. This sounds interesting! Have you seen the movie Chef? I loved that one a lot. Great post. And the movie sounds like a lot of fun. Thanks for the amazing review. Looking forward for more. This is kind of Chinese New Year comedy movie, might be watching it with friends next week. I think it has a good story. With food being among the center points, it would really be a good watch for culinary lovers. I feel so connected with this foodie style of series though not sure whether i will watch it unless they have subtitles in English. Solid review here. Movie looks fun and interesting. I’d watch a version with subtitles. I do watch a lot of Japanese stuff. Thanks for sharing.Keep it up! I love movies that revolve around food. Because I love food too! Lol. But really, it makes it more enjoyable to watch. This movie’s an interesting one, comedy is always welcome in my book. I wonder if it will be showing in Malaysia cinemas soon, sounds like an interesting movie to watch and it’s featuring my favourite food too! Gong Xi Fa Cai first of all 🙂 I am yet to watch any Chinese movie but I do watch some scenes on YouTube and all…Your review is really good. Seems pretty a good movie to watch and binge yourself out. I wonder if this is available in Netflix? Will check later! A clear review btw, it made me see a little of the movie without the spoiler. Sounds like an interesting film. I watched Kitchen musical series and loved it and I feel this is gonna be in similar lines!